Women represent nearly 50 percent of gamers and are rising in influence in the e-sports industry. However, they face challenges such as gender gaps and financial support to fund creative projects within their careers. 1,000 Dreams Fund is working to change that — and thanks to the incredible support of our partners, including HARMAN, Allied Esports, and HyperX Gaming, we launched the BroadcastHER Academy Challenge. 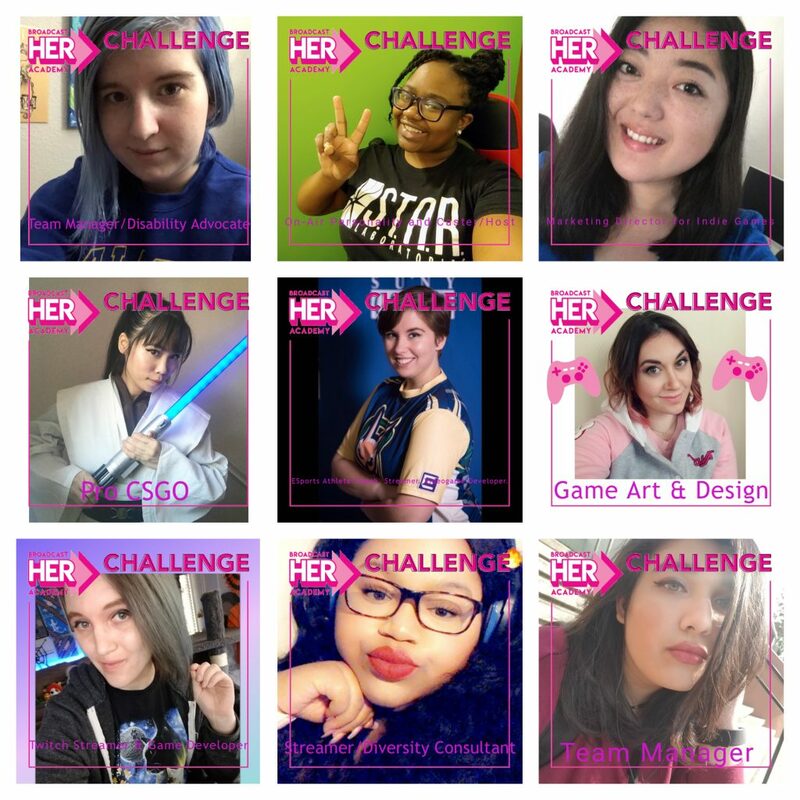 The challenge provides funds to established female broadcasters to create educational and inspirational content, which encourages and inspires other young women to successfully pursue opportunities in gaming and across the live video broadcast marketplace. Without further ado, let’s meet our BroadcastHER Academy Challenge winners! 1. Kira Smith/@iamrebelrebel – “I hope to be able to bring e-sports up to the recognition and business/legal standards of mainstream sports and help organizations with team management. 3. Giselle Colon/@RaineShadow – “I’d love to make indie games and be a full-time Twitch streamer.” Read more about Giselle here. 4. Juvylen Obe Libor/@Obe_Won – “I want to be a professional CSGOGIRL gamer. Winning this challenge helps girl gamers like me to be recognized for e-sports because there is a great diversity of gamers that are making a positive impact.” Read more about Obe here. 7. Hannah, @heyaroo – “I am an aspiring marketer for indie games! My enthusiasm for marketing began at 12 years old when I created promo videos of my favorite games to encourage others to play them. Fast forward 11 years, and I now have a degree in public relations and advertising and have developed marketing strategies for multiple clients. I am eager to go back to my roots and help promote indie games and grow their player base and community. 8. Stephanie Shero, @Zeloinator – “I would love to be a team manager and/or disability advocate in the e-sports community. 9. Devin Stephens/@DevineGoddessXO, MBA student at University of Louisville – “My career goal in gaming is to stream and represent plus-sized women of color. Women of color are underrepresented in the gaming community — but, plus-sized women of color even more so. Winning this grant affords me more networking opportunities so that I can consult streamers, broadcast platform executives, and game developers on diversity. From everyone at 1,000 Dreams Fund: Thank you for participating in our BroadcastHER Academy Challenge! And a huge shout-out to our partners HARMAN, Allied Esports, and HyperX for making the gaming dreams of our young women come true! To learn more about the BroadcastHER Academy and meet our grantees, follow this link.